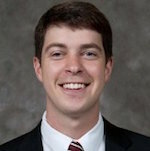 Kevin Copp was named assistant athletic director for video services at Temple University in July, 2015. In his role at Temple, Copp oversees the video services department, which provides on-demand video content on OwlsTV as well as in-venue video boards at Lincoln Financial Field, the Liacouras Center, and Pearson-McGonigle Hall. Copp also oversees production of all live broadcasts for numerous sports on OwlsTV, and serves as on-camera talent and a play-by-play broadcaster on occasion. Copp came to Temple after six months as the director of new media for Towson University Athletics where he produced and/or supervised the production of all video content for TowsonTigers.com and the Towson Athletics YouTube channel. Copp also produced and directed live video broadcasts and in-venue video boards at Towson’s arenas and served as a broadcaster for basketball, lacrosse, gymnastics, baseball, and softball. Prior to his time at Towson, Copp spent five years at the University of Georgia, first as a video production assistant and then as the video production manager for Georgia IMG Sports Marketing. He was responsible for producing and editing video while also serving as on-camera and play-by-play talent. He supervised the staff that produced the live broadcasts for six sports, and also cut video for highlight films and produced weekly shows. Copp started his career at Georgia as an intern for Georgia IMG Sports Marketing. During that time he also worked as a play-by-play broadcaster for the SEC Network and ESPNU for various events, and did weekly interviews and play-by-play for the Georgia Bulldog Radio Network. Copp earned his bachelor’s degree in English from Georgia in 2010. He is not a stranger to Temple, having been an intern in the athletic communications departments at both Temple and UMass-Dartmouth while working toward his degree at Georgia. Copp married the former Kate Burkholder in June, 2014.